Patients who feel the presence of plaque on their teeth often describe it to Dr. Oka, their Kona dentist, as being a slimy or even "fuzzy" sensation. This indicates that bacteria in the mouth has combined with carbohydrates - like those found in sugary or starchy foods - to create an acid that works to wear away the enamel of the teeth. It takes about 48 hours for plaque to harden into tartar, a chalky sediment that requires professional dental tools to remove. If you're not brushing, flossing or visiting your dentist regularly, you likely have plaque or tartar buildup and need to make an appointment with your Kona dentist as soon as possible to remove it. 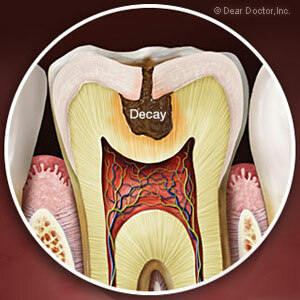 Toothaches are often extremely uncomfortable, but many people ignore dental problems in hopes that they'll go away. Your Kona dentist, Dr. Garrett Oka, strongly advises against this. Allowing dental problems like cavities or abscesses to spread can result in serious infections in other parts of the body, and treatments can quickly become lengthy and expensive. Any ongoing pain originating in your teeth or gums warrants a visit to Sweet Tooth Dental. Bottom line from your Kona dentist: if you think you need a dental appointment, or you can't remember the last time you visited the dentist, it's time to call Sweet Tooth Dental for an evaluation. Taking charge of your dental health is an important aspect of your overall well-being.